Today is National Pet Memorial Day, a day of remembrance that was begun by The International Association Of Pet Cemeteries and Crematories. 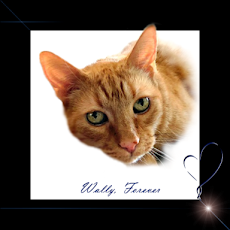 This is a day that is designated to remember our beloved pets who are no longer with us. What is a "Soul Kitty?" It is a once-in-a- lifetime pet. The yin to our yang. A pet tied more deeply to us than many people in our lives have been, or could ever hope to be. Our fur babies are ALL special, but I believe if you think really hard, there is just one who stands out from the others. The one whose fur would be dampened by our tears as he snuggled peacefully by our side just to offer us comfort. The one who would make us laugh til our sides ached at all of his kitty crazies and craziness. For my Bobo and all of those one-of-a-kind kitties who have touched our lives, you are deeply loved, you are deeply missed, you will never be forgotten. Thank you for the years of self-less love and joy, thank you for the gift of YOU. 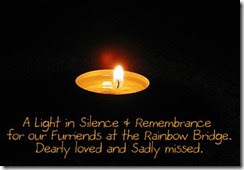 When an animal dies that has been especially close to someone here, that pet goes to Rainbow Bridge. There are meadows and hills for all of our special friends so they can run and play together. There is plenty of food, water and sunshine, and our friends are warm and comfortable. All the animals who had been ill and old are restored to health and vigor. Those who were hurt or maimed are made whole and strong again, just as we remember them in our dreams of days and times gone by. The animals are happy and content, except for one small thing; they each miss someone very special to them, who had to be left behind. They all run and play together, but the day comes when one suddenly stops and looks into the distance. His bright eyes are intent. His eager body quivers. Suddenly he begins to run from the group, flying over the green grass, his legs carrying him faster and faster. 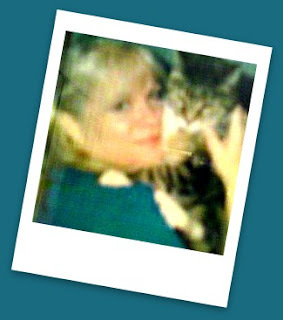 The cat before me was my human's soul kitty, and she still misses her a lot. Every time Mommy walks past the Herb section at the supermarket and see Dill and Basil, she would automatically think of Looppy as those were her favorite herbs and they were so hard to find when Looppy was still alive (1999 - 2002). Such a sweet post. Have a really lovely Sunday. (((Caren))) Lots of hugs as you remember Bobo. I still occasionally miss my two horse soulmates, and of course miss Chumley and Annie. I don't think another cat will be as in tune with me as Annie was, but of the four I've had as an adult in my life, only Derry is my "baby." Maybe because he's just so sweet and teddy bear-ish. I have at least three soul mates in cats, one horse, and probably one or two dogs. But that was a terrific tribute to Bobo. It is amazing how they creep into our hearts and just stay there forever. I will take my animals over any human any day of the week. Take care. Sweete tribute to BoBo. I have had three soulmate cats prior to Sammy - those relationships are amazing when you are blessed with them. It's amazing how often the memories still pop into my head at odd moments which simply reminds me that they are with me ALWAYS in my heart. Happy Sunday of Memories Caren! A beautiful tribute to Bobo, Caren! 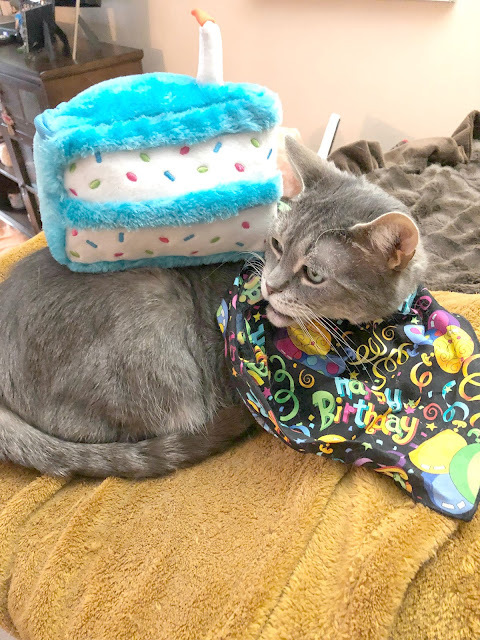 I'm sure Bobo has met many friends over the Rainbow Bridge and who knows, Bobo might be a good friend of Laura and Hana and they just live next to each other. They might be watching over us all the time, smiling and reading our blogs, shaking/nodding their heads when they see how spoilt the rest of the furkids at home. We do miss all of them a lot, don't we? Have a lovely Sunday, Caren! Take care. What a sweet, loving tribute. It's amazing how attached we can get, isn't it? Losing my little friend just last weekend was difficult, and we're all still sad here. Dad looked over his old pal Isaac's cards and things yesterday and he still, after many years, couldn't completely read the cards and rainbow bridge story without choking up. Hugs to you as you remember your Bobo. Even though these soul kitties are in our hearts forever, we still never stop missing their physical presence. Beautiful tribute to your sweet "Baby Bobo". I can see the sweetness in his face. Thinking of you as you remember your precious one. So thankful we have the memories and we never forget aren't you? Big warm hugs and some nose kisses from all of us sweet Caren. We didn't know today was National Pet Memorial Day. Thanks for letting us know. This is a wonderful tribute to your Bobo. He certainly was...is...loved. Thanks for sharing that loving tribute with us. You heart will always smile with the best Bobo love. Our Mommy knows just how you feel. You are so right. My heart breaks. Fortunate or unfortunate as it may be, love has no meaning apart from sadness. The roots of love we carefully cultivate and care for grow deep into the heart only to be replaced with the same depth of sadness one day that serves as a memorial. It stands as a lasting testimony that our love was real. my heart goes out to you as you remember..
Oh we so understand. Mommy still wets our fur occasionally over Ryker. Those soul-kitties get into a human's heart forever. What a beautiful tribute to Bobo. Our mom still misses Sweet Praline all the time. This is such a loving tribute to your little sweetheart. I feel so blessed to still have Kassey, don't know how long. I don't know how I ever made it before being chosen by her. 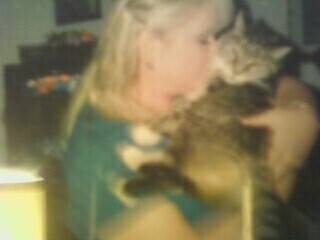 My Human's Life-Kitteh was a big gray boy called Mr. Teeth. He was all those things I am not--cuddly, soft, caring, a great big ole lovey-dovey guy ::shudder:: Well, I think The Human will a-member me for a whole OTHER set of reasons, MOL! I think the best way to remember our soul kitties is to love some more. What a blessing they are- however long they are with us. My human tells me all the time that I am her guardian angel and the kitty of her life. I bet Bobo is looking over you and protecting you from above. It's a lovely tribute to Bobo! Oh! We know just how you feel! 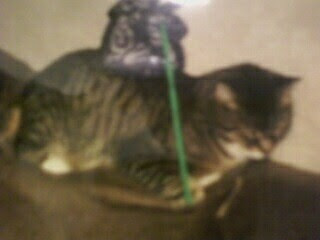 Our mom still mopes about her favoritest kitties too. 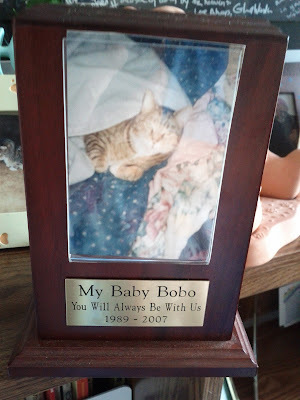 Lovely post and tribute to Bobo, Caren. Thank you for sharing him with us. Here's to all the kitties who have touched humans in a special way. Oh, Caren...what a beautiful post. Reading this touching tribute to your sweet Bobo is making our eyes leaky. It's it just amazing how so many of us have had (and have) those once-in-a-lifetime connections with a special pet. Just imagine if all the homeless kitties out there could have a family to call their own. Wow...the world really would be a better place. Thank you for sharing Bobo with us. 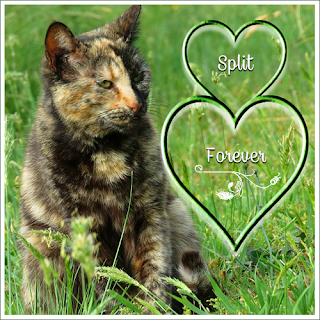 What a sweet post of remembrance to your kitty soul mate. Thanks for commenting on my post today! Wow! This post brought several tears to my eyes as I tried to imagine what I would do without my "Gracie". She came into my life when everything else seemed to be turning upside down. She was my rock. Thank you for this post although I know it must be hard to relive such emotion sometimes. But, you made me appreciate all the more the time I have with Gracie right now. @Oui Oui I sooo understand! @Meg & Quill thanks so much! @Texas thank you so much for that thought. Bobo was such a handsome boy. He was also quite large. I agree with you, he is definitely watching over me. 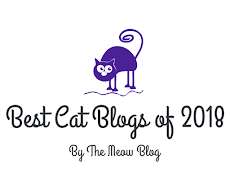 Purrs and ((((hugs)))) to you too! @GreatGranny thank you! Kassey is sure a lucky girl! @CATachresis thank you and enjoy every moment with your boy!!! @Brian "the best Bobo love" Love it! @Pam so true and how blessed you were to have had THREE soul kitties before Sammy and of course Sammy is a soul kitty as well! 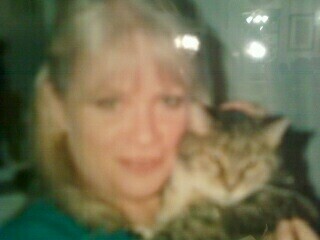 @Marg I'm with you and I love how so many of your animals are your "soul" babies! @Fuzzy Tales so true and I love how you mentioned "in tune" that's it completely. Bobo was so "in tune" with me. 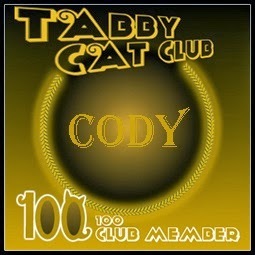 Cody and Dakota aren't. They are more about "them"
@Sparkle ((((hugs)))) to your most special Mama!!!! !